Remember the late King of Pop with this clever percussion ensemble medley from Alfred’s Pop Percussion Ensemble Series. 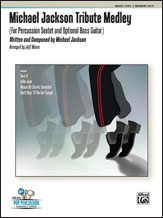 Play the hit songs that changed the face of pop music in this unique arrangement for a six-part percussion ensemble, with optional bass guitar for extra support. Songs in the medley include Beat It, Billie Jean, Wanna Be Startin’ Somethin, and Don’t Stop ‘Til You Get Enough. Includes parts for Orchestra Bells, Xylophone, Marimbas 1 and 2, Vibraphone, Bass Guitar, and Drumset.